Every few years I decide to go blonde. I was blonde as a child, and since then have dabbled in auburn, red, and dark brunette. I take something of a “grass is always greener” approach to my hair color. And so I find myself blonde again. The problem is my hair leans to brassiness. The ashy beige blonde I had two weeks ago quickly becomes a strawberry blonde drawing Emma Stone comparisons. Emma Stone is fabulous, but when you’re not intentionally a redhead, it’s the last thing you want to hear. The easiest fix is a purple shampoo or hair treatment. The purple neutralizes unwanted orange bringing you back to a cooler tone. This is also wonderful for people with grey hair who find it yellowing, or even brunettes whose hair leans too red. There are plenty of options for natural hair products, but I couldn’t find anything in a purple shampoo! My requirements were that there were no sulfates, parabens, silicones, synthetic fragrance, or toxic dyes. After a LOT of research, I found Everescents Berry Blonde Shampoo, Conditioner, and Treatment. 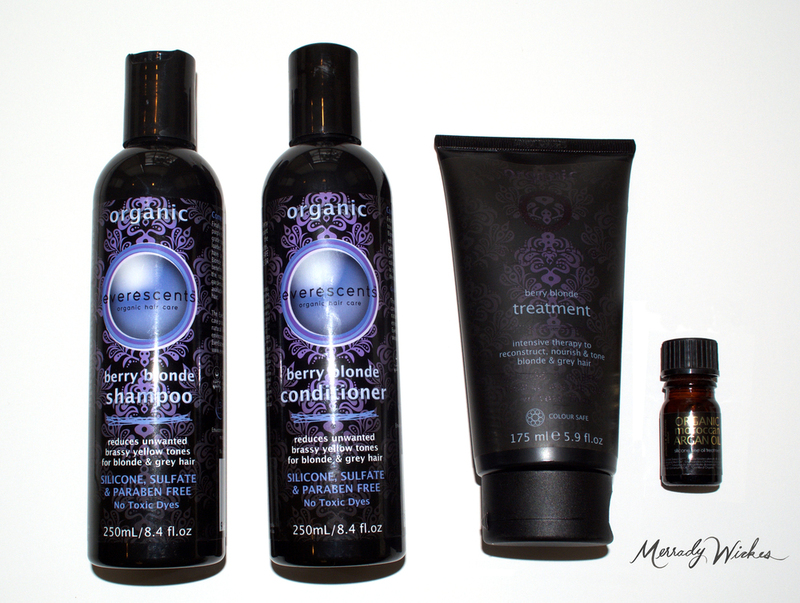 Made in Australia, these products fit all of my requirements, and were even organic! They’re formulated with Argan Oil, Vitamin E, Provitamin B5, and a blend of active essential oils including sage, rosemary, and horsetail extract. The toning effects are from red sweet potato and blue gardenia berry. I have been blown away by these products. People at work asked if I’d just gotten my color done (nope!). My hair feels soft and hydrated, but not weighed down. I was advised that you can’t over-tone with these products, so don’t be afraid of turning your hair blue. They are safe to use as often as every day to maintain your color. The shampoo is an indigo tone. It has a very fluid consistency, but feels concentrated, and has a substantial lather. I apply the shampoo with my head flipped over to make sure I can really work it into my scalp all over. Once applied I allow it to sit as long as possible. Maybe 1-2 minutes in the shower, but up to 10 if I’m in the bath. The conditioner (pictured on the right), is a soft sheer blue tone. I work this in from ears down and allow as long as possible to penetrate and tone. The treatment (top) is a bit thicker, and is formulated to restructure damaged hair. If you are experiencing breakage or have extra dry or coarse hair, I recommend using this in place of the conditioner. Otherwise you can use the treatment once every week or two as a mask for an extra boost. The only site I found that would ship from Australia was Wildilocks. Not only will they ship, they are very helpful and prompt. I advise choosing the standard air mail option. I had my products in under a week. It also helps that the AU to US dollar conversion works out in my favor, so it was very reasonably priced. So excited to have found my go-to hair care. Until I switch colors again!